It shows him arriving at the arena, getting to his place from the photo well, runs through all of War Pigs and Into the Void, and is interspersed with great still shots, and concert video. You won’t want to miss this. Few experiences in music compare to witnessing the meeting of classical training from a legendary band long away from the stage . The rarity of this type of event , beyond the exhaustion of supply artists with the status of ” legend” only contributes to further enhance such occasions . Concerning the return of Black Sabbath , the impact is still huge , even in the face of adverse circumstances: after several disagreements ee meetings over the past 15 years , the group returned to the road in the final last year , with a new disc recorded by three quarters of the original line-up – drummer Bill Ward sat out for ” contractual reasons ” . There was more drama on the way : guitarist Tony Iommi revealed suffer from lymphoma and is currently undergoing treatment. Not that the trio needed to do much to please . Ozzy , Geezer and Tony seemed excited and willing enough to cross without the crises set list of 16 songs on spiked two-hour show . Ozzy is the perfect frontman par excellence : Few vocalists as exhibit genuine pleasure to raise and interact with fans from atop the stage. Do what you can , what , in its current state it does not mean much movement : Ozzy bit moves, being countable on the fingers of the hand the times he left the mic and went to the ends of the scenario . The routine is as predictable as irresistible : presenting each song title , he incessantly asked palms , suggested choreography and demanded that the audience screamed or “get crazy” . Iommi and Butler also did not get the attention for mobility: parked like a monolith and without changing the concentrated expression , the virtuoso bassist ever leaves the station on the left side of those who watch ; already Iommi , who did not give an indication of going through a treatment health , shows more attitude , even without great boldness : guitarist maximum is heading up the side of Butler during a solo , but returns to the right even before someone realize that he changed his position. Not that there was anything wrong , after all . All these aspects have always been part of the experience provided by Black Sabbath live . For the public, the behavior can also be described as static , yet had a chance to be more active. It quickly became clear that this is a show to be watched more than experienced in a more physical way . 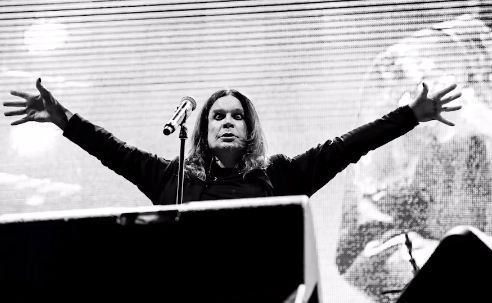 As much as Ozzy tried repeatedly provoking the crowd , the truth is that there was little to be done : the music of the Sabbath are rarely quick and Pulsed enough to stimulate pogo wheels , palms or repetitive jumps ( on ” Children of the Grave ” whose main riff brings a certain groove , vocalist ordered : . “Jump ” was obeyed , but it was short lived ) . With emphasis on riffs Iommi , not as memorable lyrics and unconventional chorus , the repertoire of the Sabbath is not the kind that invites widespread singing – the most repeated theme of the night the crowd was an impersonal ‘ole , ole , ole , ole ” . Adding these features to the almost intimidating trio of forward positioning , the result is a warm show of strength with regard to the artist- fan interaction. Nobody is to blame in this case – is just confirmation of the contemplative nature of a presentation of Black Sabbath , as it has been since the band was established in the late 60’s. Without taking any deviation or nor , the repertoire of the Sabbath remains the same since the beginning of the second phase of the current tour , marked by the release of the disc 13 , last June . In the first of four shows in Brazil (the group still rings in São Paulo , Rio de Janeiro and Belo Horizonte ) , there were no surprises , perhaps with one exception : in ” Under the Sun ” , in Vol IV (1971 ) , the band omitted the melodious coda ( baptized in certain versions of the album as ” Every Day Comes and Goes ” ) . Was the only jarring moment in relation to the band’s performances in the last three months. Incidentally , this and previous track , ” Into the Void ” , Ozzy ‘s voice has signaled it would not reach certain levels . Printing dissipated thereafter , with the singer more comfortable , especially in the songs from the new album ( the most severe adjustments in relation to the original recordings , as in the songs of Paranoid , Ozzy not allowed to work so hard ) . It was also notable that the singer rarely failed to follow the teleprompter with the “glue ” of the letters , even in newer tracks like the single ” Is God Dead ? ” . Discounted these details , the whole performance was very Ozzy what is expected of him, declared love and blessed the crowd , drew attention , smiled and sometimes makes guy who got lost along the way. But Ozzy is as focused as Butler and Iommi – the ” slips ” are part of the charm of the artist, who has secured for himself the position of permanent frontman in the history of heavy music . The most relevant aspect, the sound , the Sabbath live is an increasingly impressive experience, even more because not resort to any additive : what is heard comes “only” Gibson SG Iommi , Butler Bass and efficient battery and well crafted guest Tommy Clufetos . The sound and solid wall does not give chances to voids , even during solos – the resounding bass notes horseback riding not only fulfills , but offers an alternative to the iconic licks and riffs by Iommi stitched with remarkable precision melodic beauty and brutal ways . How authentic metal workers , the two musicians perform the office with martial efficiency, almost without allowing improvisations or poetic license , except where one or another note out of place (the fact that the band have appeared sullen in Birmingham , in the English industrial area not is a detail that should be ignored ) . After more than 40 years of activity and playing the same list of classics ( ” Paranoid ” , “Iron Man” , ” Black Sabbath ” , ” Snowblind ” , ” NIB ” ) , impresses and excites realize how much the founding members of the Black Sabbath are efficient at what they do , still sounding original and relevant after four decades . It is as if the excessive practice only had spontaneously become more efficient . The Sabbath today still manages to sound like it was that shy band blueseiras inspirations that played into tiny stage in front of handfuls of drunken bikers in 1969 . The naturalness is the same , and the overwhelming power of the songs too. In the case of Ozzy , Iommi and Butler , the weight of age just means more experience and maintaining a well-deserved and undisputed status of living legends . For those who watched the show , the inevitable feeling was to be witnessing rock history being written . Awesome. Something very special. Unique. GREAT. ANYONE ELSE NOTICE LED ZEPPELINS PHYSICAL GRAFFITI IN THE BACKROUND AT THE 14 SECOND MARK??? It is very rare for me to post anything on forums or comments anywhere, but I felt compelled to write something here. I woke up today not in the best of moods or health. Gustavo’s footage and pictures of Black Sabbath totally changed that. 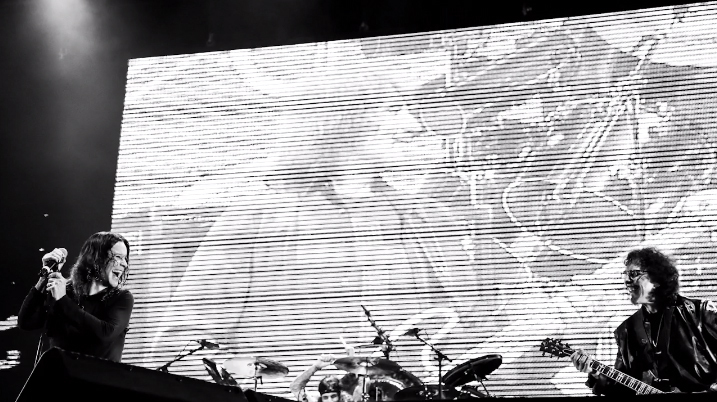 It captures in an amazing way the experience of Black Sabbath. The fun, the youthful energy, the ‘you are not in this alone’ vibe, the thrill of the Sabbath wall of sound and so much more. In quite a few photos, Ozzy and Tony look revitalised and you can clearly see they are having as much fun as the audience. Great work Gustavo! Thank-you. Thanks for posting it Joe. This is a great post,, @ Mike E ,,( i really appreciated reading your comment as well. I full agree ,, those photos are some amazing captures of the guys and they look really great!) I love the black and white shots of Tony ,, some of them are the best pics ive ever seen of him. Im extremely stoked,, ill be witnessing my very first Sabbath concert in Halifax next month ,, also a first time for them as well ,, Ozzy played there on the Black Rain tour , but a first for Sabbath in all there years of touring.. Im extremely thrilled to see this show,, which i thought only would of been a distant dream ,, but has turned into a reality.